Banana fritter? Fried banana? Banana something. 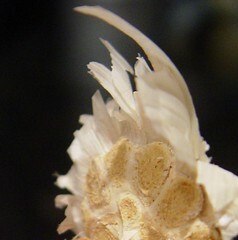 a dried slice of banana. I’ve never heard of friend banana, but i have heard of a fried plantain. Haven’t tried either of them…now that I think about it, each time i visit your site I’m reminded of just how much I haven’t tried. I’d better get busy living! Ahhhh !@!??@!! 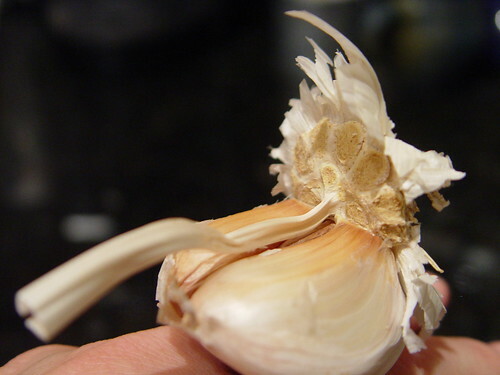 The garlic…the garlic…I’m melting…I’m melting. See what you did to this vampire chick! Yes that bottom photo is all that is left of me. Sheeeshh…that bites. Dried fruit of some sort? Banana? whatever it is – it looks like there is a TON of buttery, flaky goodness….yum! 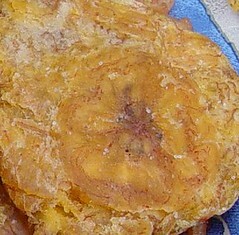 Deep fried plantain, or (stealing this from magpie) a fritter. THAT is a fried banana. Maybe even a banana fritter. Cheri says: The bite I took out of Adam Lambert’s shoulder during *ahem* . . . I think it is a fried green plantain chip!!!! Well it looks like banana but I know you don’t like banana so it must be something else…. I’m stumped but I know it’s food. I got the garlic right, does that count?